The Capital Chamber Choir is currently preparing to present an ambitious concert at the annual convention of the Royal Canadian College of Organists in Kingston, Ontario. 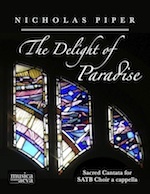 The programme includes The Delight of Paradise, which the choir premiered at last summer’s Music and Beyond Festival. This dramatic work is a seven-movement tour-de-force, a rewarding challenge for choirs, and sure to please any audience. The choir is rehearsing diligently to prepare this major work for its performance, which takes place at St. George’s Anglican Cathedral, July 11, 8:00 P.M. The concert is sure to be a major success. See you in Kingston!